Got Damage From the Storm? Talbot – Photo by South OB Girl. 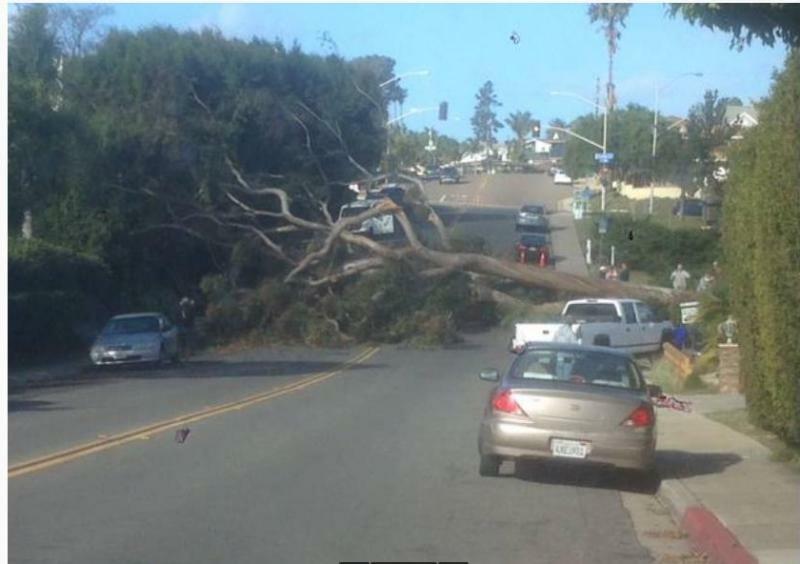 Just about every neighborhood has a tree or large branch down. Palm tree on Bolinas Street, near Voltaire. Photo by Stephanie. 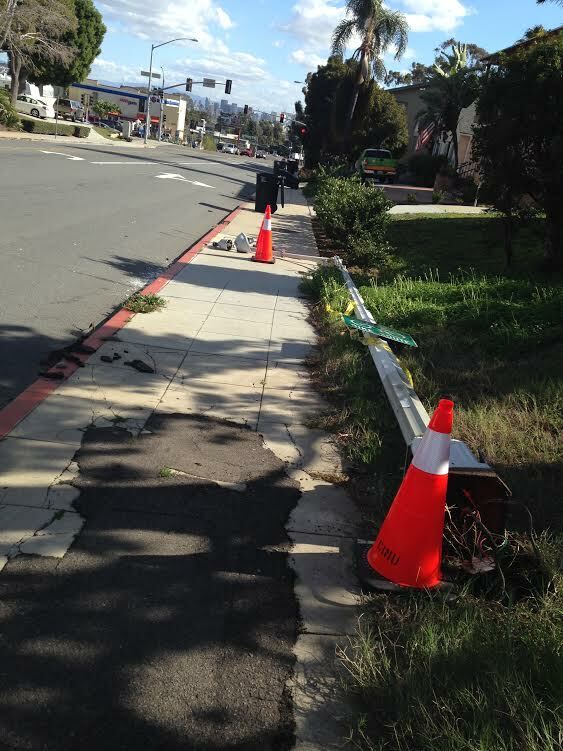 looks like the storm may have knocked this streetlight over at Lytton and Locust. 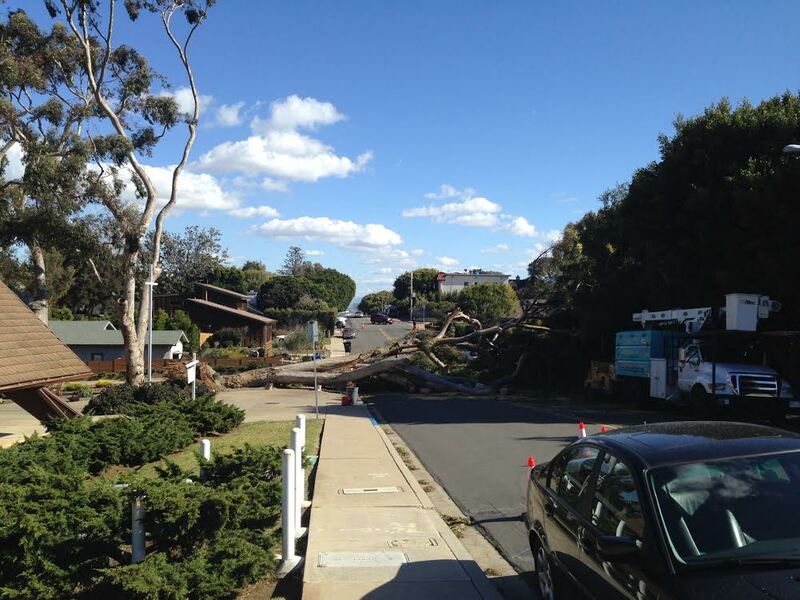 Palm tree hit house on Bolinas. 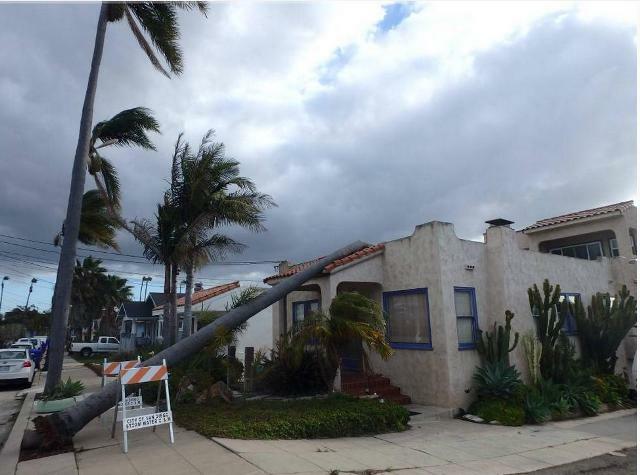 The most amazing thing I saw this morning was KUSI’s reporter in PB, standing near the corner of Ingraham and Fortuna, in front of what was clearly a downed large pine. 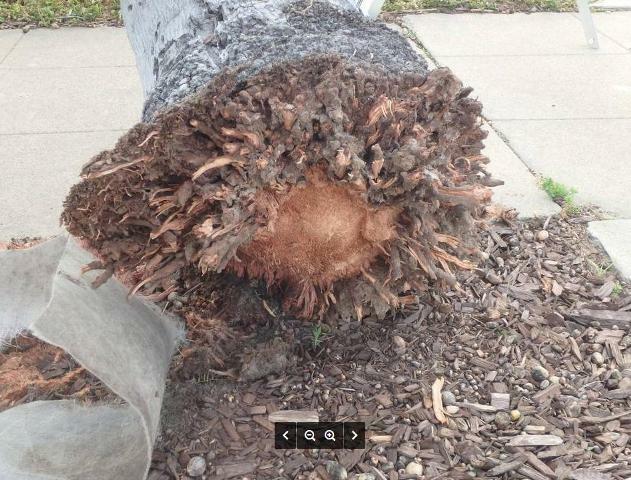 The reporter called it an “oak” several times. Is this newsperson really so ignorant that he cannot recognize a conifer? certainly the branch over the street should have been trimmed, because the whole tree also leaned in that direction. Glad to see your first concern is getting the species of the tree correct rather than the sad fact that someone tragically lost their life. 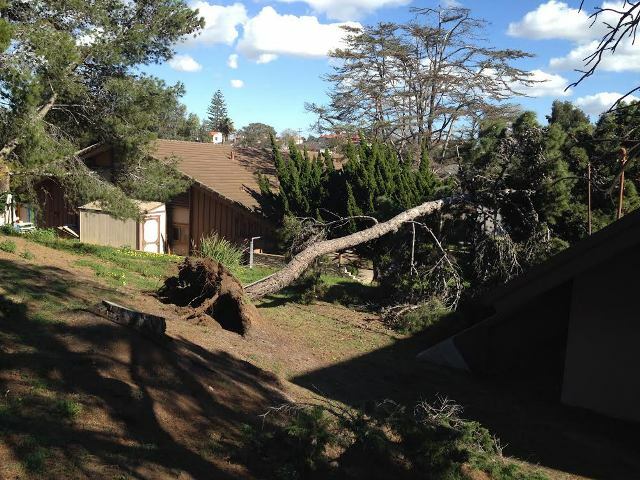 I heard that a tree in the lunch area at OB Elementary was on the verge of falling and that some kids had to move classrooms for the day just in case – was expecting photos here, as I didn’t pass by the area today to check it out myself. Sometimes our staff gets spread thin. And I’ll inform Patty and editordude of your feelings. 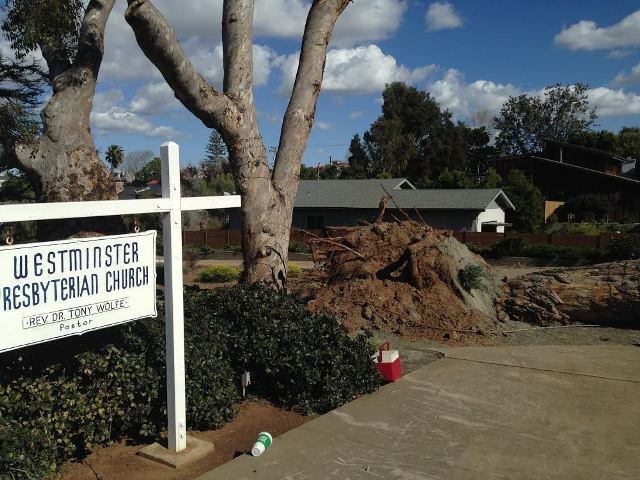 Okay, it’s up – photos of the large tree at OB Elementary felled by the winds. Thanks for the heads up. Dave – We were able to disable the time limit. See if that helps. Frank Gormlie April 25, 2019 at 1:30 pm on News and Notes from Ocean Beach and Point Loma – April 2019Yeah, like gay rights, legalization of marijuana and voting blue. 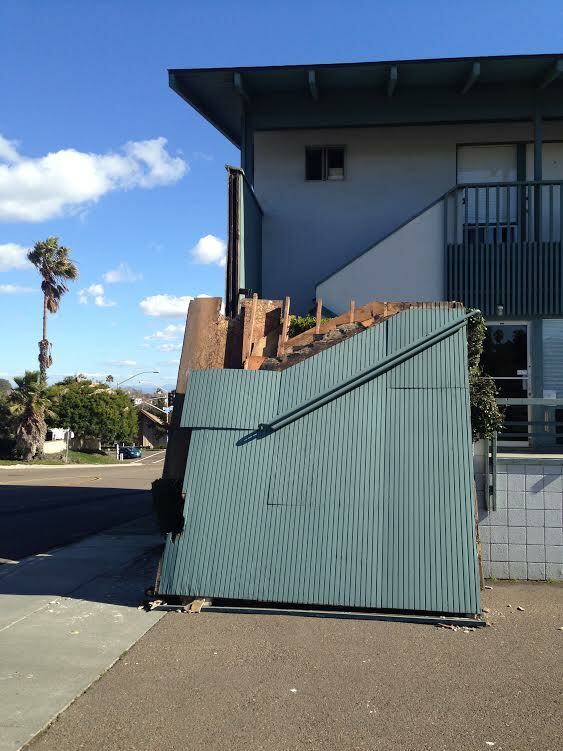 Frank Gormlie April 25, 2019 at 1:29 pm on News and Notes from Ocean Beach and Point Loma – April 2019Okay dokay, I'll make the change. Thanks Deb. OBKID April 25, 2019 at 11:22 am on News and Notes from Ocean Beach and Point Loma – April 2019"thing in SF" haha - like poop all over the streets?? SD will pass on all things Bay area. ZZ April 25, 2019 at 11:07 am on News and Notes from Ocean Beach and Point Loma – April 2019Purebred puppies are generally around $1500-3000 these days. rick callejon April 25, 2019 at 10:23 am on Weak Scooter Regulations Passed by San Diego City CouncilPlease wear a helmet. FJL April 24, 2019 at 4:32 pm on Weak Scooter Regulations Passed by San Diego City CouncilCall me cautiously optimistic but these regulations, if indeed are enforceable, are better than I expected would pass. Irene Wilton April 24, 2019 at 2:48 pm on Losing a Loved OneThanks for bringing us together, lets not wait 10 years for our next meeting.